Panda cubs at an enclosure in China have been forbidden from predicting the scores at the football World Cup. The giant bears had been primed to choose their food from various baskets emblazoned with the national flags of the teams, thereby predicting winners. But moments before the opening game kicked off, the Chengdu research base pulled out of the stunt. The idea of animals predicting football scores has become a standard publicity stunt for zoos and other organisations. The most famous example from the last tournament was Paul the octopus, who apparently correctly guessed the winners of games until the semi-final. This year, a whole variety of animals across the world are being touted as the successor to Paul. The pandas' attempt to emulate Paul had been eagerly anticipated on social media. 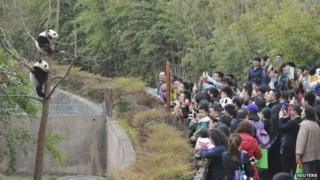 But late on Thursday, the Chengdu facility said it had been ordered to stop the stunt. "The predictions have been halted by the authorities," a spokesman told the AFP news agency without giving any details. However, the Chinese newspaper Global Times quoted a spokesman from the research enclosure as denying the authorities had stepped in. The spokesman said the stunt had been cancelled by the research centre because it would have harmed the pandas by requiring too much contact with humans.